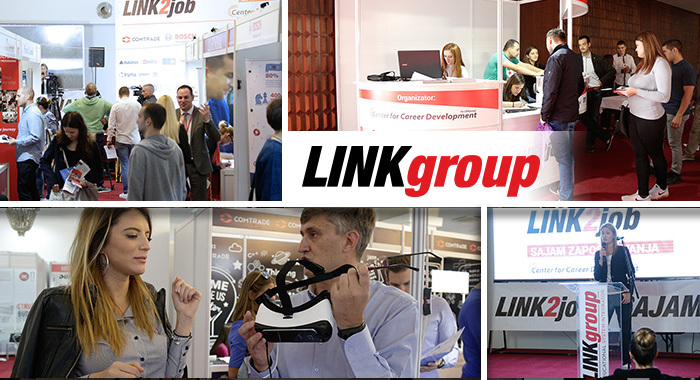 The fifth LINK2job employment fair, held on October 20 at the Hotel Yugoslavia, attracted 5000 visitors. The fair was organized by the Center for Career Development, with support from the City of Belgrade and the National Employment Service (NES). The attendees got the opportunity to present themselves in the best light to 40 exhibitors and apply for 300 vacancies. The fair was officially opened by City Manager Goran Vesić, deputy director of the NES Belgrade branch Siniša Knežević, as well as the representatives from LINK group. Nowadays, to employ one person is a great success. With that in mind, providing 300 jobs is a significant achievement for which I congratulate LINK2job organizers. The city supports all employment fairs and we are proud of the fact that this year, 66 000 Belgraders have found employment and that the number of unemployed people has fallen below 100 000 for the first time in ten years. We are a nation that learns a lot, and today only learning and constant self-development can lead to a secure job. Most jobs are found in the IT industry, the service sector, tourism and civil engineering – said City Manager Goran Vesić. Siniša Knežević, deputy director of the NES Belgrade branch, wished all the participants at the LINK2job fair good luck. For ten years we have supported and participated in all fairs aimed at reducing the unemployment rate. I encourage all unemployed people to be more aggressive, to cooperate with NES and actively work on their education and development. I wish all visitors of the LINK2job fair luck in finding the right job, and the employers in finding the right employees – said Siniša Knežević. A special part of the LINK2job fair was dedicated to motivational speeches on professional success and personal development. This segment was opened by Nataša Kovačević, a former basketball player and founder of the Nataša Kovačević Foundation, who gave an inspirational speech. Nataša gave valuable advice to numerous visitors, as well as inspiration to overcome any obstacle they may encounter. I am very glad to be here, since I haven’t had the opportunity to participate in such an event. I believe LINK2job is the perfect chance for unemployed people to find a place in the sun. This event is truly authentic, and I think it’s very important to unemployed people to have a place where they can connect with companies who may be looking just for them. If can use my story to motivate at least one person to race toward their goal, I will regard it as a great success. My message to all young people is the following: if you are courageous enough to dream, you will be courageous enough to fulfill your dreams – said Nataša Kovačević. Every interested fairgoer received a free English or computer course. Throughout the day, useful lectures and workshops were held in order to help candidates boost their knowledge and confidence for future job interviews. In addition, the ITAcademy Design Studio provided all visitors with a professional photo for their CV. In order to make the visit to the fair a unique and new experience, all fairgoers had at their disposal the Job Box, Laptop Corner, and the Social Network Corner, where they could simulate job interviews with HR employees and receive advice on what to improve and how to use modern technology to follow the current job offer and apply for a desired position. This LINK2job employment fair was a unique opportunity for all unemployed people to try to join large companies such as ManPower, Comtrade, Robert Bosh, Sitel, Nelt, WinWin. The next fair is scheduled for spring of 2018.